Musing through Everyday Africa’s Instagram page is like taking a long, whimsical walk through a decolonized continent. A hope filled place where neighbours peer over each other’s improvised fences and converse candidly with the warm sun on their backs, kids happily running wild in the backdrop. 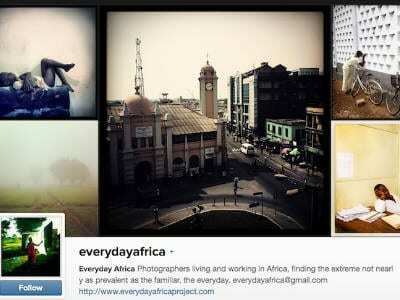 We caught up with co-founder, Peter DiCampo for the idea behind the Everyday Africa’s concept and pros and cons of the Instagram social platform. PD: The idea — as two journalists who have lived in West Africa for a few years each at different times in our lives — was to create a project that represents how we feel about daily life in Africa more than our usual stories allow. Austin Merrill and I were traveling in Ivory Coast in March 2012 as a writer/photographer team covering the continued strife a year after the country’s post-election violence. Austin is intimately familiar with Ivory Coast, having previously lived there, and I had been there before as a photojournalist and had lived several years “next-door” in Ghana. During that trip, we realized that the photos we were shooting casually on our phones felt much more familiar to us than the ones I was “professionally” shooting for the story. I think often about the process of photojournalism – going into a story, you often feel you “know” the images needed to tell it. If it’s a story with phrases like “continued ethnic violence,” you feel you need photos of refugees, burned down homes, survivors with horrific stories to tell, etc. These are the images that will make sense to the reader, that he or she will find palatable. But there’s an inherent contradiction here: if we’re giving the reader images he or she already expects, then the story reinforces preconceptions and doesn’t teach anything new. Along the way, we also see a lot of daily life moments, but we often pre-edit these out of our story by not even photographing them. Austin and I decided to photograph them. A couple months later, we were both on the continent again, at the same time but in different locations – he in Nigeria and Zimbabwe, me in Uganda. We kept shooting on our phones, and this time around started a Tumblr blog so we could share the images with each other and a wider audience in real time, or close to it. In the months that followed, we found that a lot of our colleagues shared our frustrations with coverage of the continent and were excited to have an outlet for the day-to-day images. We migrated to Instagram (but kept the Tumblr too) to extend our reach, and things grew rather quickly – we’re up to nearly 60,000 followers on Instagram and about 15 regular contributors. NB:The site has been up for over a year, have you noted any resultant change in the media’s portrayal of the ‘Dark Continent’? Well, I certainly can’t claim that anything has changed as a result of our little project! One thing that excites me beyond belief is that the American and European (and even Japanese) editorial worlds have taken an interest in us and published our work (National Geographic, The New York Times, Newsweek Japan, Internazionale, etc). This tells me that, even within the traditional Western media system that our project is a reaction to, editors recognize a need for a different kind of portrayal, a different narrative. I see this outside of Everyday Africa too, of course. Look how successful projects like George Osodi’s Nigerian Kings or Andrew Esiebo’s barbershops have been. There are more and more stories of African business and development in Western media, etc. All of that said – the commentary we receive on our photos on Instagram is a constant reminder of the uphill battle. It is so strongly (and strangely) ingrained in the American mindset that Africa is a devastating place in constant need of help, that even the most innocuous or even lighthearted pictures can sometimes illicit comments like “I wish I could help them,” “God give them the help they need,” etc. And the image will be something like a group of girls laughing and playing jump-rope! NB: Our Social Media Week 2014’s theme is ‘A Connected Africa is the Future’; 55 countries, millions of people, post-war meltdowns. Do you believe that this could be possible through the power of social media and internet? I certainly hope so. I’m connected to friends in rural Africa in ways I wouldn’t have imagined a few years ago. And I expect that Africa will continue to bypass the West in unforeseen ways — to bypass the technologies that aren’t useful for them, the way most people have skipped over landlines, and skipped straight ahead to using mobiles to pay their bills and transfer money. Americans are still catching up! I’ll be interested to see the limits of that connectivity, and to see those limits constantly expanded. Your question mentions post-war situations, and has me thinking on all those efforts in various countries to reconcile, the groups both foreign and domestic that go from village to village trying to help the healing process in post-war countries — it won’t be long before we see this connectivity applied to these situations. I was just teaching a photography / social media workshop in Sri Lanka, a country recovering from civil war, and the students were from all over the island and very excited to use Instagram to learn about each other, to learn about these different ethnicities and religions that their parents fought against. The same uses of social media and imagery will materialize in African countries, if they haven’t already. We’ve realized that, in calling our project “Everyday Africa”, we should be looking at what those words mean from a variety of perspectives — not just professional photographers, as the project has been so far. As you mention, cell phone usage is growing, and with it the use of cell phone photography. People are documenting their daily lives all the time. To reflect that, we’re trying to create a new platform that allows for anyone to post images, so those stories can be shared widely. It will be a platform that allows the viewer to sort the images by country – all the images from Liberia, from South Africa, etc. – but far more interesting is that they will also be able to sort them based on who the photographer is, be it farmer, businessman, African photographer, Western photographer, tourist, tour guide, villager, mother, nurse, etc., however the photographer identifies himself or herself. As professional photographers, we’ve made nice pictures – but to me it’s potentially much more interesting to be able to click a button and see every photo taken by a teacher, for example, regardless of country, and see how they view the world around them. NB:How do you choose with pictures go up on the site as I’m almost certain you get tons? When Nichole Sobecki joined us, Sarah Leen, Director of Photography at National Geographic, selected Nichole’s photos and posted them with commentary. The most fun, most interesting thing so far was a recent segment on Nigeria: Helon Habila, the Nigerian author, selected the work from four photographers – Jide Alakija, Andrew Esiebo, Glenna Gordon, Jane Hahn – and posted their photos with his commentary. We’ll be doing other things along these lines, and some even more creative ideas that I don’t want to give away just yet.And while the long-term goal is to have a new platform that anyone can contribute to, we also plan in the short-term to have a segment of user-submitted photos (we get them all the time), hopefully sometime soon. NB:Do you think this all would be possible without the iPhone and Instagram? Well, those are specific tools. Give me a Samsung and Flickr and it probably would have happened too. But if you strip away the brand name — the tools themselves are essential. Phone photography, and platforms that allow images to posted in a narrative stream, are essential to the democratization of making and sharing photos. NB:Back to the idealism behind Africa, do you think we’ll ever be able to permanently shake off the “famine, war-stricken, destitute” label of Mama Africa’s beautiful face? I’m optimistic! I think it’s happening, at an excruciatingly slow pace, but it’s happening. Call it the growing pains of globalization – people are traveling more, often becoming more transient (How many Nigerians do you know that sort of live in New York but sort of live in Lagos? ), investing more in Africa, etc. These exchanges will have their positives and negatives — talking about investment is a huge can of worms — but in terms of cross-cultural perception, it’s allowing people from the rest of the world to see, increasingly, the sides of Africa we aren’t often shown. It’s very sad that this even had to happen in the first place – but slowly people are learning that Africa can be just another place.